SP Setia Bhd group managing director and chief executive officer Tan Sri Liew Kee Sin says the company will focus next year on cash-generative and cash-accretive projects that will further strengthen its balance sheet. It plans to take advantage of opportunities which may arise during the current financial crisis. WHAT is your outlook for the local property market in the coming 12 months? The global economic slowdown will be a challenging time for all developers. Securing sales as well as maintaining profit margins will not be easy. However, we should not talk ourselves into a recession. There is still ample liquidity in the market and the country is in a strong position this time around compared to many other Asian countries. The reduction of EPF contributions from 11% to 8% has also provided support in increasing the nation’s disposable income. On the assumption that the slowdown in developed countries does not last beyond 2009, the country should be able to weather this storm relatively well. Where SP Setia is concerned, we are in a solid position because of the width and depth of our market. Most of our properties are catered towards landed residential homes within townships. On top of that, prices of our products start from as low as RM200,000. Although there are predictions that the mass housing market segment will be the worst hit by the current external environment, our view and experience with the mass housing market is that it is in fact a very resilient market segment supported by strong demographics and a fundamental demand for homes. The sub-urbanisation trend – where households move away from the congestion of the KL city centre into more spacious and modern suburban dwellings – is also unlikely to be reversed, given the scarcity of affordable homes closer to the city centre which offer the kind of lifestyle amenities sought by the current generation of housebuyers. Townships that are connected along the main highway arteries should see robust and sustained demand for commercial properties over the mid- to long-term. By this reasoning, high-end residential properties in more central locations should also do well by virtue of the fact that it is likely to be in short supply given the expected increase in demand from people working in the city centre. In your opinion, how has the global financial meltdown impacted the performance of the local property market (in terms of project launches, take-up rate and unit price)? Developers are taking a more cautious approach in business given the economic outlook. Launches are slowing down but that does not mean that we should stop building. The mass housing sector has proven to be a resilient market in the past. In fact, it was this sector that contributed to SP Setia’s success and growth during the 1998 crisis. From one brand called Setia, we now have five brands which are Setia, Duta, Sky Residences, Eco and Commercial. I believe if you have the right product mix, there will be sales. Has the market slowdown affected SP Setia’s project launches and product pricing? Not really. As a company, we are coping very well. 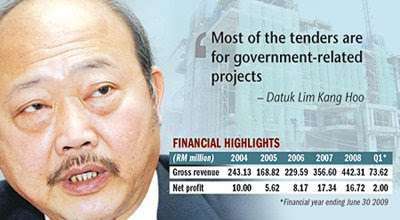 Our financial position is strong and we will finish off 2008 with a record sales performance of RM1.4bil. Our main focus for 2009 is on cash-generative and cash-accretive projects which will further strengthen our balance sheet to enable us to take advantage of any good opportunities which may arise during the current financial crisis. Even in current conditions, we are making investments in projects which have long-term growth or yield enhancing potential such as the Setia City Mall in our Setia Alam township. We will also continue to brand-build – our experience from the last crisis has proven that an economic downturn can sometimes be the best time to grow a brand. What are some of the company’s strategic plans to ride out the challenging market, including plans for its Vietnam project? The group’s strategy is to maintain a diversified range of properties in different geographical locations and across all income brackets so that we can attract a wide spectrum of customers. Currently, SP Setia has projects in three different states in the country – the Klang Valley, Johor and Penang. We have to continue to reinvent ourselves, setting new benchmarks and pushing the envelope to deliver the best to customers. We strongly believe in continuously differentiating ourselves to stay on top of the game. There is always a continuous flow of marketing-driven activities and customer appreciation events to keep buyers and prospective buyers in the loop as the best form of advertising is through word-of-mouth. About 60% of our customers are actually through referrals. Despite the current macroeconomic instabilities coupled with the suburban living trend being a relatively new concept in Vietnam, we are confident that the idea will take off. Our show village should be ready in the first quarter of next year and this should help give a better visualisation to potential purchasers of what SP Setia is capable of. We feel that the sub-urbanisation of housing and offices is inevitable given the congestion, inadequate infrastructure, cramped living quarters and expensive office space in central cities like Ho Chi Minh City and Hanoi. In this sense, we feel that SP Setia has a distinct advantage in Vietnam as building suburban townships is our forte. What will be the main growth drivers for SP Setia for the coming one to two years? The current uncertainty surrounding the global economy will undoubtedly have an impact on the business environments and domestic economies of countries around the world, and Malaysia is unlikely to be spared. In this context, it is more prudent in the short to medium term to adopt a more flexible business model that is centered on projects that are cash-accretive and cash-generative. In short, we will refocus on our forte, which is building townships which offers stable earnings growth by targeting the resilient middle-income segment of the property market. In the light of the positive demographics, high household savings rate and relative job security of this particular income segment, the fundamental demand for township properties is likely to be sustainable, particularly in townships where significant investments in infrastructure and amenities have been made upfront. A good example here is our Setia Alam township in Shah Alam. Apart from the RM150mil interchange that we built to connect the township from the NKVE expressway two years ago, today, we have a Tesco hypermarket that opened in October and the Tenby Private and International School which opened in neighbouring Setia Eco Park in September. Ekovest Bhd, a property and infrastructure developer, is bidding for seven to eight projects worth up to RM5 billion in total, as it hopes to pile up its order book for rainy days. "Most of the tenders are for government-related projects. They involve both buildings and infrastructure," said executive vice-chairman Datuk Lim Kang Hoo after the company's annual general meeting in Kuala Lumpur yesterday. The company's earnings growth over the near term is highly dependent on its order book valued at about RM600 million, mainly derived from two projects. The bulk of the orders is expected to keep the company busy over the next two to three years. "Barring unforeseen circumstances, we are hopeful that we can sustain our earnings growth this year," Lim said. However, the company stressed that any cancellation or post-ponement of the major jobs in hand, such as the new phase of Universiti Malaysia Sabah and two contracts with Universiti Teknologi Tun Hussein Onn Malaysia, could hurt its ear-nings significantly. "There is always a possibility that projects are put on hold. We have been through it and experienced it in the past. "Nevertheless, we are prepared. If the worst happens, we may have to scale down and cut costs. Of course, we may not have to go through that. We'll just have to see how it goes next year," Lim explained. The company posted a 55 per cent decline in net profit during the first quarter ended September 30 2008. Besides banking on winning more local jobs, the company, which took part in a highway project in India three years ago, has set its eyes on more overseas projects. Initial talks have begun and feasibility studies are ongoing. "We are looking at places close by, such as Indonesia and Vietnam. We think this is the right time to look into it, especially when prices are falling," Lim said. The company is also looking at how it can participate in the Danga Bay Waterfront City Development, which has been aborted due to the unfavourable equity market conditions. "We are looking at measures on how to participate in it ... and considering a joint venture with other parties or through direct investment. A decision should be made by the middle of next year," Lim said.